Some young people are lucky enough to get a new car from their parents. Veronique- Boss Drouhin got her own vineyard and winery. Veronique-Boss Drouhin is the daughter of Robert Drouhin, who along with Veronique’s two brothers, oversees the prestigious nègociant house in Beaune, Maison Joseph Drouhin. Founded in 1880 by Robert’s great uncle, Joseph, Maison Joseph Drouhin has a lofty image among respected nègociants in Burgundy. Growing up in a winemaking family, Veronique was destined to become the fourth generation to fulfill the family’s tradition. She graduated from Dijon University in 1985 and with urgings from her father, traveled to Oregon in 1986 to receive practical experience in winemaking according to the gospel of David with David Lett at Eyrie Vineyards, David Casteel of Bethel Heights, and David Adelsheim of Adelsheim Vineyard. Robert Drouhin had visited Oregon in 1961 and was struck by the resemblance of the Williamette Valley to the Côte d’Or. He was particularly impressed by David Lett’s Eyrie Vineyards 1975 South Block Reserve Pinot Noir which finished ahead of some of Drouhin’s Burgundies in blind tastings. In 1987, Robert Drouhin bought 100 acres in the Dundee Hills overlooking the town of Dundee and sent Veronique to oversee planting of the vineyards in 1988. She crafted the first three vintages, 1988 to 1990, from purchased grapes, and these wines were well received by the wine press. More land was purchased (today there 225 estate acres, 84 of which are planted to Pinot Noir and Chardonnay), and in 1989, a new four-level gravity-fed winery was constructed. Much of the winemaking equipment in the new winery came from Beaune. Maison Joseph Drouhin became the first Burgundy house to make wine outside of France and remains the only significant Burgundy presence in the New World. The vineyards at Domaine Drouhin Oregon (DDO) are among the most densely planted in the United States. The objective was to create more competition among the vines leading to lower yields. In 1988, when planting began, the norm in Oregon was for vines to be 6 feet apart and the rows 8-10 feet apart. Initially a compromise was struck and the vines were planted 1 meter apart with the rows planted 7 feet apart. The initial plantings were Pommard and Wädenswil clones on their own rootstock since no phylloxera-resistant rootstock was available at the time. In 1989, DDO transitioned to a 1 meter by 1.3 meter template creating over 3,100 vines per acre (a typical vineyard in Oregon is 800-1,400 vines per acre) and the vineyard was converted to primarily Dijon clones 115 and 777. DDO became the first Oregon winery to plant the new Dijon clones and the first to use phylloxera-resistant rootstock. The close plantings necessitated the importation of a special French tractor to assist in farming. Severe pruning has been the rule and the resultant low yields are such that a vine only produces about 3/4 of a bottle of wine. Phillipe, Veronique’s brother, has managed the vineyards since the beginning. Chardonnay came later, with the first release of Arthur, named after Veronique’s son, in 1996. Over the years, Veronique-Boss Drouhin (her husband, Michel Boss, is a website designer and together they have three children) has been a long-distance winemaker and continued to live in Beaune, traveling periodically to Oregon to oversee DDO. Barrel samples are sent to her by Fed Ex so she can monitor the progress of the wines. She has developed quite an affection for Oregon and its wines. She says, “I have no doubt that the finest Pinot Noir outside Burgundy will come from Oregon, also perhaps from New Zealand. I’m not so sure about California, where the climate is warmer, the wines are richer and more powerful.” That said, she believes Oregon has a ways to go. “I am not prepared to say that we are yet making great wines, wines that move us and inspired great emotion. That we can do in Burgundy with out best crus, and that is our challenge in Oregon.” (Quotes from Wine People by Stephen Brock, 2001). The Pinot Noirs of Domaine Drouhin Oregon have emphasized balance and elegance over robustness, and although they can be quite charming upon release, they age magnificently. Oak character is kept to a minimum (new wood has been gradually decreased over the years to about 20%). The grapes are usually all de-stemmed, natural yeasts are employed, and the wines are aged for twelve months in barrel. Veronique likes to say that the wines are “Burgundian at heart, but with North West intensity.” The wines have more extraction and fruitiness than those from Maison Joseph Drouhin, but less extraction than many other Oregon Pinot Noirs. Three Pinot Noirs are produced. The Domaine Drouhin Classique ($45) is held in bottle for nine months before released (10,000 cases). It is a soft, accessible style. The Domaine Drouhin Cuvée Laurène ($65) has been made since 1992 and is named after Veronique’s first daughter who was also born in 1992. This is wine is a barrel selection showing more structure, extraction and age ability. (2,000 cases). The Domaine Drouhin Cuvée Louise was first produced in 1999 and is named after Veronique’s youngest daughter. It is a special selection of favorite barrels and is extremely limited (8 barrels). The Louise has a little less structure than the Laurène, but with more elegance and finesse ($80). It is sold only at the winery and to winery club members. The Domaine Drouhin wines have been consistent in quality and this has not gone unnoticed in Burgundy. Despite this, the Burgundians are a conservative lot which explains why Maison Joseph Drouhin remains the only Burgundy house with a serious Oregon commitment. There have been a string of talented Managing Directors at DDO. Bill Hatcher was the first and after fourteen years left to be part of a partnership that operates A to Z Wines in Oregon. Scott Wright followed him and now owns Scott Paul Wines in Carlton The current Managing Director is the affable David Millman. If you need any information about Domaine Drouhin Oregon Wines or wish to arrange a tour, contact him at david@domainedrouhin.com or phone 503-864-2700. The winery’s tasting room is open Wednesday through Sunday from 11:00 AM to 4:00 PM and offers the opportunity to taste Oregon and French wines side by side. Recently I had the pleasure of attending a dinner and vertical tasting of Domaine Drouhin Pinot Noirs at Parkway Grill in Pasadena, California. The hosts, David (below right) and Janeen Lee, are literally lovers of wine (check out their website: www.loverofwine.com). Fifteen vintages of Domaine Drouhin Classique dating back to 1992 and two vintages each of Domaine Drouhin Laurène and Domaine Drouhin Louise were presented. The evening’s conversation was spirited and the food was exquisite. David Millman (below standing left) was present, and his encyclopedic knowledge of Domaine Drouhin wines, as well as his bonhomie, made for a special event. A few observations: (1) The first three vintages of Domaine Drouhin Pinot Noir, 1988-1990 were made from purchased grapes; (2) The wines are in general closer to Burgundy in style than many Oregon wines; (3) All of the older good vintages aged remarkably well. The 1992 and 1993 Domaine Drounin Classique Pinot Noirs were spectacular and would hold their own against any Cote de Beaune Burgundy from those years. Several years ago, Veronique Drouhin-Boss remarked that “The wines from Oregon don’t so far have the longevity of the best Burgundy wines. But as viticulture practices improve, I expect the wines will become more long-lived.” Maybe the wines don’t have quite the longevity of many Burgundies, but their age ability is surely superior to many New World Pinot Noirs. 13.5% alc.. · Still flaunting admirable color and freshness, this beautiful wine was soft and smooth, showing attractive hay and cookie dough aromas and elegant spice-kissed cherry flavors. A ringer for a well-aged Cote de Beaune wine. 13.0% alc.. · From a particularly good vintage and one of Veronique’s favorites for its good acidity. Complex nose of herbs and musk leading to tart red fruit flavors. Zippy acidity on the finish produces a refreshing conclusion. 13.5% alc.. · More showy with lush, velvety Pinot fruit. The aromatics are quite enticing featuring cherries, green tea and floral accents. No oak to be found. Quite impressive and would attract California Pinot Noir lovers in heat. 13.5% alc.. · The 1995 through 1997 vintages were difficult ones in Oregon. The 1995 remains the best of the trio in my mind. There is still plenty of fruit here with secondary notes of leather, mushroom, barnyard, and cedar showing up. 13.0% alc.. · A very delicate Pinot Noir that is fading and out of balance, with brisk acidity to the forefront. Still a respectable drink with food. 13.0% alc.. · The lightest wine in the lineup. Very shallow fruit, simple and linear with racy acidity on the finish. 13.0% alc.. · Deep in color and showing rich, ripe red fruit flavors with herbal accents. Nicely balanced and perfectly fine now. 13.0% alc.. · I wrote “great” and that pretty much says it all. Redolent of ripe cherries, cassis, musk and hay, with a silky and plush mouth feel. Perfectly harmonious, this wine is poetic. 13.0% alc.. · Fine but not spectacular. Attractive, but demure herbal-toned Pinot fruits, soft tannins, and a clean finish. 14.1% alc.. · Deep aromas of crushed berries and wild herbs. More density and cherry fruit than the previous vintage, highlighted by musk, earth and spice. An outstanding wine that warrants a special occasion. 14.1% alc.. · The string of excellent vintages continues and this beauty is right in step. Certainly drinkable now, but has many more years ahead. Tasty berry and cherry fruit blended together creating a broad presence on the palate. 14.1% alc.. · A warm vintage in Oregon creating a wine of significant color and extraction but more simple and singularly fruit-driven. You make what the vintage gives you, but this wine is atypical for the DDO style. 14.1% alc.. · Back on track with this vintage. A lovely and complex Pinot Noir showing an enticing herbal theme that runs through DDO wines. Grand in every way. 13.9% alc., $45. · The aromatics are redolent of a fresh cherry pie. In the mouth the cherry attack continues and the whole package is beautifully balanced. A bit angular due to its youth, but offering an enticing glimpse of what is to come. 14.1% alc., $45. · Bright and fresh sporting red berry and red cherry fruit with a razor sharp finish. Like a frisky, young pony. 14.1% alc.. · A robust wine that is gentle and perfumed, yet sweet and dense on the palate, exhibiting more density and dark fruits than the Classique wine of the same vintage. The core of gentle tannins is wrapped in layers of fruit. A Pinot Noir love letter. 14.1% alc.. · Similar to the Classique of this vintage, but ramped up a notch. Seems awkward at this stage with an unusual medicinal note dampening my enthusiasm for it. 13.0% alc.. First year for this wine, only 75 cases. · A magnificent combination of power and finesse. Wilted roses and ripe red cherries in the nose, Great expression of Pinot fruit on the palate. Immensely satisfying and probably net yet at its nadir. 14.1% alc.. · Very big in structure and ripe in style. Copious amounts of rich, plush red and dark fruits. Reflective of the very hot vintage. 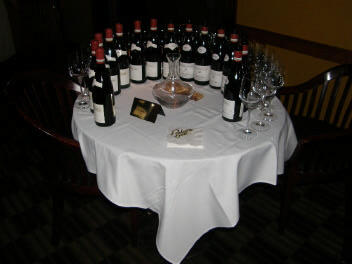 I attended a less extensive vertical tasting of Domaine Drouhin Oregon Pinot Noirs in early 2005. Tasting notes on that tasting are in the PinotFile, Volume 4, Issue 27. Domaine Drouhin Oregon (“Beaune in the USA”) is located off Breyman Orchards Road about two miles west of Highway 99W in Dundee. The phone is 503-864-2700 and the website is www.domainedrouhin.com. We are blessed to have this French-inspired treasure in our country. Pink-hued wines made from Pinot Noir go by many names including rosé, blush, and vin gris. Rosè is the French word for pink. Vin gris (van GREE) is French for gray wine. The French refer to darkskinned grapes as black or noir and grapes that are somewhere between black and white as gris. There are no pink grapes (grapes with pink skins) per se, but red-skinned grapes can produce wine that is dark red, pink or white. Rosés can be made from any red grape, but along with the rising popularity of Pinot Noir, has come increased numbers of rosé Pinot Noir from respected vintners in California and Oregon. Rosé is produced in a manner that makes it charming to drink immediately, although serious examples may improve over a year or two. There are basically three methods of production. The first, taking a white wine and adding some red wine to it, has fallen out of vogue. The second approach involves lightly crushing the grapes, chilling them, and cold macerating them for up to 48 hours. The juice is then drained off and fermented in stainless steel in a manner similar to the production of white wine. The third, or saignée method, eliminates the cold soak. Whole or crushed grapes go to a fermentation vat. The color is periodically checked, then the free run juice is drained or bled off to finish fermentation in a separate tank. In the last two methods, fermentation is completed without further skin contact, leaving the color and flavor compounds of the skin behind. The juice is typically bottled shortly after fermentation with no oak barrel aging. Think pure Pinot Noir juice without woody enhancement. In some cases, producing a rosé can actually enhance the quality of a Pinot Noir since removing some of the clearer juice concentrates the color and flavor compounds from the skins in the remaining juice. Rosé wines are nothing new and, in fact, they have introduced many neophytes to wine over the last fifty years. Slightly sweet Mateus and Lancers rosés were a favored quaff of young people of my baby boomer generation and more recently white Zinfandel, which is the highest-volume wine produced in California, has filled the role. These sweet rosés appeal to the American soda pop palate, but often lead to interest in bone-dry versions which have become increasingly de rigueur in restaurants in Paris (often Pinot Noir versions from Sancerre), Spain (where it is called rosado), Italy (rosato) and barbecue tables here in the United States. Once considered summer sipping wines only, dry rosés have become one of the world’s most versatile food companions. Best when served slightly chilled, they are not meant to be contemplated, but to be enjoyed for their refreshing charm. He wrote the only book published on rosé wines, Rosé, A Guide to the World’s Most Versatile Wine, in 2005. The same year he founded Rosé Avengers and Producers (RAP) along with Daniel Moore, Jim Kopp, Carol Shelton and Paige Poulos. The organization is dedicated to advancing knowledge and appreciation of fine rosé. Since 2005, RAP has held an annual PINK OUT! Celebration in San Francisco. The most recent PINK OUT! drew forty-five international producers and sold-out crowds of consumers, winemakers, media and trade. Details of RAP membership, which is free, are available on the website, www.rapwine.com. I recently tasting several rosé wines made from Pinot Noir. The quality was very high. In several cases, the packaging was quite alluring. The prices of the nine wines ranged from$16 to $25 with an average price of $20. Although not inexpensive, the cost reflects the time and expense incurred by seriously commited wineries dedicated to making this style of wine. I chose these rosés because most of them are widely available in retail channels in this country. What food to serve with these wines? Just about any summer fare will work including hamburgers, sausages and hot dogs, poultry, seafood and spicy dishes. Rosés do have enough tannins to stand up to savory food. The color of the wines ranged from an apricot to a deep pink, reflecting the amount of time allowed for the wine to remain in contact with the skins of Pinot Noir grapes. The aromas were in general shy and not particularly complex. Unlike Pinot Noir where much of the enjoyment comes from smelling the wine, rosés’ pleasure come from the flavors more than the perfume. One nice feature of rosés is that an unfinished bottle may be recorked and kept in the refrigerator for several days without significant loss of flavor. I just returned from the Anderson Valley Pinot Noir Festival and I had a rosé moment. My wife and I had flown and driven much of the day to arrive in the Valley on a very warm evening. We attended a barbecue featuring locally-made sausage, local mustards, and a simple green salad. There were many wines available to choose from, but I went directly for a chilled glass of Toulouse Anderson Valley Pinot Noir rosé. It was a marvelous accompaniment to the simple, but thoroughly enjoyable fare, and a perfect drinking companion as the sun continued to exert its unseasonally strong influence on the fading daylight. I have listed the rosés in order of my preference. 12.0% alc. $25. This wine was exposed briefly to French oak during and after fermentation. 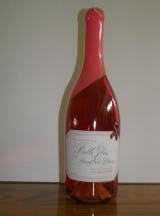 A portion of the sales of this wine go to research for breast cancer. · Medium pink-orange in color. Aromas of strawberry soda and new-mown grass. Delicious strawberry flavors with a complimentary note of toast. Rich for a rosé with an appealing persistence on the finish. Can match up with substantial food. 13.0% alc., 115 cases, $24. Whole cluster pressed, cold fermented. · Pale pink in color. Shy nose featuring red berries and baking spice. Bright strawberry flavors with a touch of watermelon. Very elegant, clean and crisp. 13.3% alc., $13. Tony Soter also crafts an exceptional Brut Rosé only made in special vintages ($45). · Pale pink in color. Shy perfume of red berries, cardamom spice, and a hint of minerality. The richest wine in the lineup with attractive strawberry and orange peel flavors. An impressively long finish. 13.8% alc., $20. Whole cluster pressed. Tall Alsatian-style bottle. · Pale apricot color. Effusive nose of wild berries, peaches, and exotic tropical fruits. Lovely stone fruit flavors with a hint of papaya, strawberry and herbs. Almost drifts to Muscat taste profile. Very smooth with a persistent finish. 12.5% alc. $18. Imported by Vineyard Brands, Inc., Birmingham, Alabama. · Pale pink-orange in color. Perfume of crushed red barriers and graham. Demure flavors of strawberries and cassis. Simple, clean and satisfying. 14.0% alc., 2500 cases, $20. · Pale pink color. Rich nose of red berries, rhubarb, and a hint of smoke. Shallow red berry, especially strawberry, flavors with a hint of herbs. Slightly dry finish with bright acidity. 13.9% alc.. $20. I included this wine because of its novelty. There are two bottlings, Gold which contains Chardonnay and other aromatic varietals from Australia, and Pink Gold, which is a vin gris of Cabernet Sauvignon from Napa Valley. Both wines contain 24K gold flakes. Tall bottle, white synthetic cork. · Pale apricot color. Fragrent strawberries, persimmon and baking spice. Strawberry and spiced peach flavors. Soft, with a clean finish. 14.1% alc., $16. From Lucia Vineyards. · Moderately deep pink color. Smoky wild berry aromas with some matchstick showing up. Red berry flavors with smoky overtones and a brambly green herbal note. A decent drink, but quite quirky for a rosé. 13.0% alc., $18. Imported by Atherton Wine Imports, San Jose, CA. · Deep apricot in color. Peculiar aromas of lacquer and varnish. Secondary flavors of aging including yellow stone fruits, red berries, tree sap and chemical. Either a bad bottle or heavily Brettinfluenced. Many of California’s prominent and ultra-premium Pinot Noir producers are now releasing a rosé of Pinot Noir and they are snapped up quickly. Two notable examples are the Pink Fiddle from Fiddlehead Cellars in Santa Rita Hills and Vincent Vin Gris from Saintsbury in Napa Carneros. 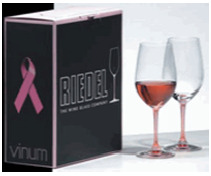 Last year, Riedel created a special, limited edition Vinum Pink Rosé glass to benefit Living Beyond Breast Cancer. The Pink Vinum Rosé glass has a soft pink stem and clear bowl. In order to determine the right shape for the Pink Vinum Rosé glass, Georg Riedel, CEO of Riedel Crystal, convened a special rosé glass tasting panel led by Jeff Morgan. 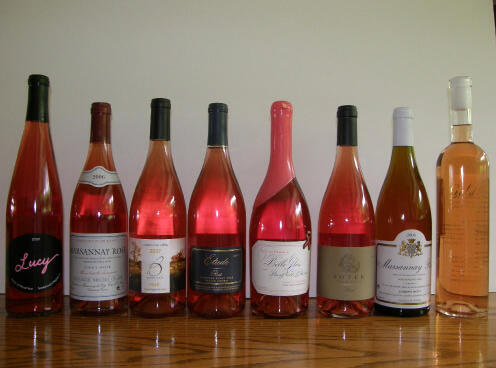 Six rosé wines from California and France were sampled from sixteen different glass shapes to determine which presented the wine to its greatest advantage. The first-ever Riedel rosé glass was preceded by the Pink “o” wine tumbler (2005) and the Pink “O” Champagne glass (2006). The Pink Vinum Rosé glass is a machine-blown crystal glass that is sold in sets of two for $39.99. A complete step up in quality and sophistication are the sparkling rosés. These are the wines of romance par excellence since they resemble the most romantic flower. In the 1963 bawdy comedy, Tom Jones, based on Henry Fielding’s novel about the wild life of a handsome young stud in 18th century England, the narrator says: “It’s widely held that too much Champagne will dull a man’s desire. Indeed it will - in a dull man.” Blanc de Noirs are made only from red grapes, are pale or light gold in color with barely visible pink reflections and may deepen in color with aging. Rosés are more full-bodied wines often darker in color, fruitier, and some are 100% Pinot Noir. Rosé Champagnes are made in one of two ways: either by macerating the skins and juice of Pinot Noir and/or Pinot Meunier grapes (saignée method), or by adding still red wine to the base wine. It is very difficult to tell in blind tastings which method has been used although the former is the more traditional method. $240. Tasted during a recent program on Krug at Grape Radio studios. · Very slight pink in color. An ethereal Champagne that offers a seductive perfume of strawberry, orange peel, yeast, smoke and exotic roses. Coats the palate with intensity and leaves lingering memories of nobility. Revs up the appetite. Sparkling wines from Burgundy, the so-called Cremant de Bourgogne, are beginning to show up on our shores. These are fine, inexpensive sparklers of all colors made from any of the Burgundian varieties (Gamay may not make up more than 20%). Many are priced around $10. 12.0% alc., $12. Imported by Boisset America, Sausalito, CA. · Deep rose in color. Winey in style with good strawberry fruit intensity and a healthy bead. A perfectly fine aperitif. Articles are beginning to surface about the effect of this country’s recession on high wine prices. The World Market Council, a St. Helen trade group, found that despite the current gloomy economic outlook, most recent data indicate that consumers are continuing to buy fine wine. United States consumption of wine has reached $30 billion and has grown at a 20 percent rate for several years. The thirst for premium Pinot Noir, in particular, seems to be unquenchable. Clos De La Tech 2005 Santa Cruz Mountains Pinot Noir $101.50. Despite the run-up in prices of premium California and Oregon Pinot Noir, the price tags look like steals compared to Napa Valley Cabernets where $100 buys you an average mid price range wine and serious collectors and flippers pay up to $500 retail. With 2005 Burgundies of the Premier Cru level commonly reaching triple digits, and Grand Crus quadruple digits, many North American Pinot Noirs look like down right bargains. Marcassin remains the highest priced after-market American Pinot Noir ($250-$450), with several others demanding triple digit prices (Sea Smoke, Kosta Browne, Sine Qua Non). When faced with several wines of varying price, studies have shown that consumers most often prefer the most expensive wines. Tasted blind, however, non-expert wine consumers will often pick the less expensive wines. People commonly believe quality is linked to price. This is definitely true with Pinot Noir (up to a point) since the expenses in farming and crafting fine Pinot Noir are high. It is risky business as well, as shown by the widespread loss of the Pinot Noir crop in Northern California this year due to frost pressure during bloom. Speaking of triple digits, see the short feature on Bodega Chacra in this issue's Pinot Briefs (page 20). 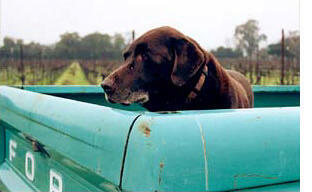 As noted in a recent PinotFile, owner/winemaker Kent Fortner has changed the name of his label from Green Truck Cellars to Road 31 Wine Co. As he says, “Same guy, same truck, (same dog), same wine ... new name!” There just seems to be way too many truck labels anyway (there is a White Truck and a Red Truck). Kent says that he was doing some family research in his hometown in Kansas last fall when he saw a sign posted to a gravel road, “Road 31.” This road ambled past his grandparents’ homestead in Kansas. Kent’s ‘66 green Ford truck willed to him by his late grandfather traveled Road 31 frequently. He decided to make the name change, but retained the picture of his green truck on the label. Kent has now been crafting Pinot Noir on his own for seven years. He crafts his Pinot Noir in cave space made available to him by friends who live in the Stag’s Leap District of Napa Valley. The 2006 vintage is his current release. The wine is a blend from four vineyards at the southern mouth of the Napa River: Stanly Ranch (clone 115), Nord (114), Suscot Ridge (Pommard), and Poseidon. He described the vintage as delicate and elegant and said that he approached his winemaking appropriately. Both Budapesti Kadar (Hungary) and Mercurey (France) oak barrels were used for aging. Kent feels the wine will hit its stride about the time of the holidays of 2008 and will be quite good for another four years after that. 14.2% alc., 950 cases, $39. · Shy fruit on the nose with Hungarian oak and herbal scents. Soft and demure red fruits with a slight green edge. The velvety texture is quite appealing and the wine is nicely balanced. This wine has everything in place but is just not ready for prime time. I suspect the fruit will emerge with resolution of the vegan aspect in another six months. The high quality of older vintages tasted recently would indicate that patience is required. 13.9% alc., 650 cases, $36. Three vineyards (Nord, Suscol Ridge, Stanly Ranch) and four clones. · Terrific nose of ripe berry jam and Asian spices. Lovely berry fruit in the mouth which is clean, lush and spicy. Everything is working beautifully in harmony, with a deft touch of oak and refreshing acidity on the finish. Impeccably balanced and outstanding in every way. 13.9% alc., 500 cases, $35. · Deep, dark crimson robe. Complex aromas of black cherry, wet oak, spearmint, herbs and minerals. Dusty dark red fruit with subtle oak, iodine, and mushroom overtones. Silky in texture with brisk acidity and mild dirty tannins. Road 31 Wine Co Pinot Noir is sold primarily to “truckers” on the mailing list. The website is www.road31.com and the phone is 707-649-1200. The 2006 vintage is sold out at winery but is available through retail channels. Tasting is by appointment. An excellent “plog” is sent to mailing list customers. 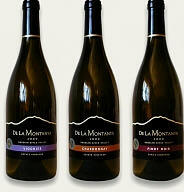 Over the years I have reviewed several vintages of Pinot Noirs from De La Montanya. It has been easy to do as the wines have shown consistent excellence. Owner, winegrower and winemaker, Dennis De La Montanya professes to enjoy big, bold wines, but he has a soft side as well , showing itself in his Pinot Noirs which deliver plenty of finesse. Dennis represents the seventh generation of a farming family, some of whom had dubious second careers as outlaws and smugglers. Dennis, himself, is a bit of a character and is the kind of winemaker you like to hang out with. He likes to talk baseball (both of his sons pictured below play). On the surface he is unpretentious and humorous, with a dry wit and a twinkle in his eye, but his wines are quite seriously rendered with the utmost care and attention. He is an ambitious sort, producing multiple varietals in small lots in addition to Pinot Noir as well as a number of special bottlings including the “Pin-Up” series of wines featuring attractive ladies in pin-up poses on the front labels and wines made for charitable purposes signed and endorsed by a number of his rock musician friends (including the band Journey and Eddie Money). 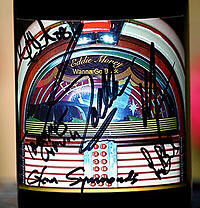 Currently a 2005 Sonoma Coast Pinot Noir, “Wanna Go Back,” is offered for sale signed by all members of Eddie Money’s band ($75) with the proceeds going to the Elizabeth Glaser Pediatric Aids Foundation. 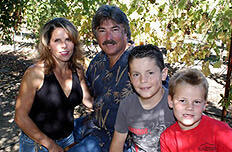 Dennis farms over 160 acres in Sonoma County and founded his winery in 1995. The tasteful barn-inspired tasting room and winery is but three miles from downtown Healdsburg. Dennis has a wood-burning pizza oven on the premises, a bocce ball court, and a picnic area shaded by mature apple trees. He rents out an adjacent lodging known as the “Little Yellow Cottage,” which has all of the comforts of home and overlooks the Felta Creek Vineyard on the property. His wife Tina (pictured) manages the Cottage as well as the three guys in the family. I recently tasted through four of the 2006 vintage lineup of De La Montanya Pinot Noirs. Every one of these wines were top shelf and Dennis’s best lineup ever. They are notable for their easy drink ability made possible by impeccable balance and harmony, a reflection of deft winemaking. All are perfect food wines. 14.2% alc., 146 cases, $38. · Lighter in color and weight than the other wines in the lineup, but don’t let that deceive you. Plenty to like here from the aromas of cherries, rhubarb and damp earth, to delicious flavors of dried cherry kissed by spice and herbs. Elegant and feminine and tres Pinot. 13.0% alc., 47 cases, $40. · Lovely nose of cherries, roses, Asian spice and a hint of anise. The flavors echo the aromas. Crisp and clean in the mouth. This wine delivers the best aromatics of the lineup, but the fruit is lacking some intensity and complexity on the palate compared to the other wines. 14.2% alc., 137 cases, $40. 75% Pommard, 25% Dijon clone. · Alluring scents of fresh Bing cherries highlighted by oak spice. Terrific mouth full of sweet cherries and a sidecar of cola, gingerbread and herbs. Like sucking on an adult gourmet cherry popsicle. Refreshing kick of acidity on the aromatic back end. A complete and exquisite wine of great purity. 14.2% alc., 48 cases, $50. · This is truly a reserve wine in every sense of the word. The nose is richer, more darkly fruited and beautifully enhanced by oak notes of char and vanilla (50% new oak here). Very plush on the palate with black cherry, cassis, plum, dark chocolate and vanilla flavors. There is admirable complexity here and plenty to contemplate. The tannins are fine-grained and the finish lingers on and on. Give this wine a year or two while you drink the others in the lineup and you will be suitably rewarded. Dennis is on a roll here. His 2005 Christine’s Vineyard Sonoma Coast Pinot Noir won the award for Best Red Wine at the 2005 Sonoma Harvest Fair, which is a big deal in Sonoma County. De La Montanya Vineyards & Winery is located at 999 Foreman Lane, Healdsburg. Check the website for directions to the winery - it can be tricky. The tasting room is open Friday thru Sunday from 11:00 to 5:00, but call ahead to see if Dennis is behind the bar. Tasting on other days is possible by appointment. The informative website is at www.dlm.com. For information and reservations for the Little Yellow Cottage, contact Tina De La Montanya at tina@dlmwine.com or consult the website. The wines are all sold through the tasting room and the website. The phone is 707-433-3711. 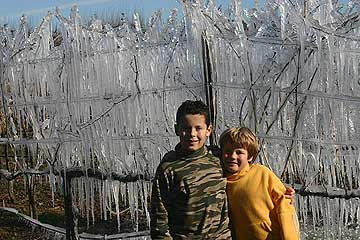 See the striking photo below of the frozen vines in April of this year at DLM. Like many winemakers, Ed Kurtzman crafts wine under his own label as well as his major label employer (Freeman). Ed is a laid-back guy who has had extensive winemaking experience including stints at Bernardus, Chalone and Testarossa. His interest in wine began as an undergraduate at the University of Massachusetts in the late 1980s, when he worked at a large wine shop. He subsequently moved to California and worked as a wine wholesaler, but realizing his calling, enrolled in the enology program at Fresno State University. In 2003, Ed joined Freeman Vineyards & Winery to pursue his interest in handcrafting cool climate varietals. 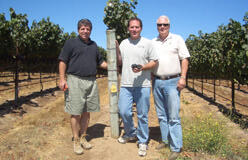 August West is a partnership between winegrower Gary Franscioni (Garys’ Vneyard, Rosella’s Vineyard and ROAR Wines), winegrower Howard Graham (Graham Family vineyard), and Ed that began in 2003. The name, August West, is derived from the Grateful Dead’s song, Wharfrat, in which the lyrics rhapsodize about August West who is down and out and drinks a lot of Burgundy. Two vineyard-designate Pinot Noirs are produced from Rosella’s Vineyard and Graham Family Vineyard, as well as a Chardonnay and Syrah. The wines are crafted in a similar style to the Freeman wines and using 40% new French oak. 14.8% alc., 695 cases, $48. · Moderately light crimson in color. Also shy nose showing demure red fruits, a little funk, herbs and a whiff of alcohol. Plush red fruits with spice and brown sugar on the palate. Easy to drink. 14.7% alc., 477 cases, $48. · Very shy aromatics but pleasant strawberry and cherry scents after intensive swirling. Decent red and black fruits with an earthy bent. Zippered up and unyielding on this day. August West wines are sold to an allocation list and through limited retail channels. The website is www.augustwest.com. Syrah and Chardonnay are also available. beginning as a vineyard during the mid-1800s, then a prune tree farm during Prohibition, and later a Christmas tree farm. Cheryl and Jim Landes along with Fred Faltersack formed a partnership and purchased the property in 1999. With the re-planting of grapes in 2002, the land has come full-circle. Multiple varieties are farmed including Pinot Noir, Cabernet Sauvignon, Syrah, Cabernet Franc, Malbec, Merlot, Petit Verdot, Viognier, Chardonnay and Pinot Gris. Winegrower Ruben Balderas oversees the vineyards. Director of Operations and co-winemaker along with Bill Brosseau, Ashley Dubois, informed me that their 2006 Pinot Noir, released March 1, 2008, is their second commercial wine. The winery plans to specialize in Pinot Noir, Viognier, and a “San Andreas Red” Bordeaux-style blend. Planned production is 1,2000 cases annually. 14.7% alc., 183 cases, $39. · Moderately deep ruby color. The aromatics are dominated by alcohol, but there are some nice black cherry and medicine cabinet notes. The spiced cherry core is enticing and the bright acidity creates a tangy finish. Definitely needs food. A respectable inaugural release for this new winery, but plenty of work lies ahead to bring this up to the standards of the California Big Dogs. Black Ridge Vineyards wines are sold through the website at www.blackridgevineyards.com. The address is 18550 Black Road, Los Gatos and the phone is 408-399-6396. I have not visited, but this beautiful setting looks very appealing. 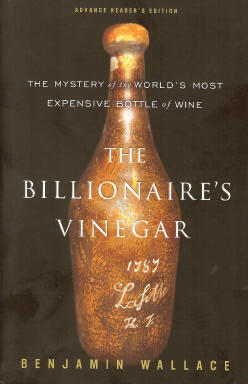 I just finished reading Billionaire’s Vinegar, The Mystery of the World’s Most Expensive Bottle of Wine by Benjamin Wallace (Crown Publishers, Random House, NY, 2008, $24.95. paperback), and just as if I had quickly polished off a glass of great wine, I wanted more. My developing passion for wine during the 80’s and 90’s coincided with the events that transpired in this story, so it was not surprising that I was enthralled by the intrigue of this tale of greed, deception and excess. The story centers on a bottle of 1787 Chateau Lafite, reputedly owned by Thomas Jefferson, which was consigned to Christie’s Auction House.. The bottle, engraved with the initials, Th. J., was scheduled to be auctioned on December 5, 1985 by Christie’s Wine Director, Michael Broadbent, the “public face” of wine auctions of the time. The consignor was a supposedly German-born wine collector Hardy Rodenstock, whose real name, Meinhard Görke, and country of birth, Poland, only become public years later after a former FBI investigator uncovered the truth. Rodenstock, who had a penchant for uncovering extremely rare bottles of wine, said that he obtained a cache of Jefferson bottles in the spring of 1985 from a hidden cellar in Paris discovered after workers tore down a house and broke through a false wall in the basement. Rodenstock claimed that he had paid $2,227 for the stash of bottles, but the exact number was never determined or spelled out by him. Thomas Jefferson, the third President of the United States, had lived in Paris from 1784 to 1789 where he served as Commissioner and them Minister to France. Jefferson was an exceptional wine connoisseur of his time and frequently purchased fine French wine. Despite this, none of his bottles had ever previously been found. The bottle of 1787 Chateau Lafite was be the oldest “authenticated” vintage red wine ever to come up for auction at the time. Christopher “Kip” Forbes, son of billionaire publisher Malcolm Forbes, was sent by Malcolm to buy the bottle at the auction. Malcolm had an extensive cellar of first-growth Bordeaux wines and even boasted of “popping open a Margaux to drink with a Big Mac and fries”. Forbes paid $156,000 for the reputed Jefferson bottle, a new record for a bottle of wine and the event was memorialized in the Guiness Book of World Records. This auction brought considerable notoriety to Christie’s and Michael Broadbent and fueled the frenzy for rare wines which had begun in 1967 when Christie’s held its first “Finest and Rarest Wines” sale. By 1985 when the Jefferson bottle was auctioned, much of the world’s old clarets had been discovered, sold and drank. It was not surprising then that counterfeiting of impossibly rare wines was becoming commonplace, leading to the premise of this book: Could the Jefferson bottle be fake as well? Solving this mystery turns out to involve all of the major wine figures in the world over the last fifty years: Marvin Shanken, owner and publisher of The Wine Spectator; William Koch, a billionaire who amassed a prodigious cellar of 35,000 bottles, and purchased several supposed Jefferson bottles; Lucia (Cinder) Goodwin, a Jefferson scholar at Monticello; Marvin Overton III, a Texas neurosurgeon who amassed a 10,000 bottle cellar; Lloyd Flatt, a Tennessean wine collector with 30,000 bottles; Tawfiq Khoury, who possessed the largest wine collection in America at the time - 65,000 bottles; Bill Sokolin, owner of the wine store, D. Sokolin & Co.; Georg Reidel, a friend of Rodenstock’s; Jancis Robinson, one of the world’s most respected wine critics; Robert Parker, Jr., publisher of the Wine Advocate; Comte Alexandre de Lur Saluces, proprietor of Chateau d’Yquem; Bipin Desai, an American collector who staged grand tastings of old and rare wine; Dennis Foley, the auctioneer at Butterfield and Butterfield in San Francisco; John Tilson, publisher of Rarieties; Yeter Göksu, a physicist who dated wine sediment using thermoluminescence; Manfored Wolf, a chemist who developed techniques for dating wine using a method for detecting the radioactive isotope tritium; James Laube, columnist for The Wine Spectator; Lord Jacob Rothschild, part of the first family of Bordeaux; Hugh Johnson, an English wine writer; Serene Sutcliffe, Wine Director of Sotheby’s and Broadbent’s arch rival; Angelo Gaja, an prominent Italian winemaker; Steve Verlin, an East Coast wine collector and one of the founders of Veritas restaurant in New York; Denis Durantou, proprietor of Chateau l’Englise Clinet; David Molyneux- Berry, a one-time Wine Director at Sotheby’s; and Jim Elroy, a former FBI agent that Bill Koch hired to root out the provenance of the Jefferson bottles. This list is by no means complete and many other wine fanciers are drawn into this drama. In detailing the mystery of the Jefferson bottles, the author reveals the fascinating history of several trends in the world of fine wine collecting which were in some way impacted by, or intertwined with, the 1985 auction of the first Jefferson bottle. These include the history of the Bordeaux wine trade, the success of the large wine auction houses, the rise in popularity of mega-tastings of old wine, the new interest in the pairing of food and wine, the emergence of tasting notes, the vertical increase in prices of luxury wine labels, the development of technology for dating old bottles of rare wine and for anticounterfeiting new releases of wine, and the historically changing center of the fine wine market which began in the UK, crossed the ocean to the United States, and most recently became centered in Asia and Russia. Counterfeiters have seen wine as an easy take and the rare wine pool is forever suspect. As Robert Parker, Jr. noted, “This is the only product in the world that you can sell for thousands of dollars without a certificate of origin.” Just this last week, Peter Hellman reported in Wine Spectator online that twenty-two lots of Domaine Ponsot Clos de la Roche and Clos St.-Denis Burgundies, worth as much as $603,000, had to be withdrawn from the April 25, 2008 Acker Merrall & Condit’s wine auction. Laurent Ponsot, the fourthgeneration owner of Domaine Ponsot, said the wines were fakes and some were from vintages that the domaine never bottled. William Koch, whose lawsuit against Hardy Rodenstock is detailed in The Billionaire’s Vinegar, filed a lawsuit against Acker Merrall & Condit two days before the auction. 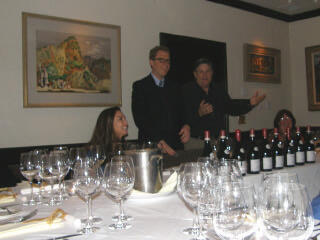 Koch claimed that he was sold counterfeit rare wines in 2005 and 2006. John Kapon, the owner of Acker Merrall & Condit is disillusioned as are many others and admits that “we might have to slow down and tighten up to ensure that some of these old treasures are what they’re supposed to be. Hellman notes that at Christie’s, any lot of wine valued at $20,000 or more must be subjected to multiple inspections by experts. It might be too little, too late. as the problem of counterfeit wines threatens the validity of multiple old tasting notes published in the world’s wine literature over the last fifty years, not to mention the large and possibly fraudulent monetary losses already suffered by a number of billionaires. Bodega Chacra A triple digit Pinot Noir from Argentina? Bodega Chacra is an estate in Patagonia at the southern tip of South America owned by the great Tuscan estate Sassicaia. It is run by family member and winemaker Piero Incisa della Rochhetta. A few years ago, Piero discovered two abandoned vineyards planted in 1932 and 1955. Two wines have been released: 2006 Chacra 32 “Trienta y Dos” Pinot Noir ($209.99) and 2006 Chacra 55 “Cinquenta y Cinco” Pinot Noir ($169.99). Piero reports that the Pinot Noirs are unlike anything from Burgundy or Oregon, being unusually deep and intense and reflecting the Patagonian terroir. Available at www.wallywines.com. Revana Family Vineyard Oregon Pinot Noir Revana Family Vineyard is a producer of fine Cabernet Sauvignon from an 11-acre property in Napa Valley. The highly-allocated wine is crafted by winemaker Heidi Barrett. Recently, the owner, cardiologist Madaiah Revana, M.D., purchased 80 acres in the Willamette Valley of Oregon which was formerly owned by vintner Chuck Ortman of California. The new project will be called Alexana and both Pinot Noir and Pinot Gris will be produced from the property. The winery website is www.revanawine.com. WineMap Oregon and Sonoma County are the first regions featured on the WineMap website (www.WineMap.org), which provides detailed winery and vineyard details as well as aerial views of vineyard and winery locations. The wine community-driven project is unique in that participating growers and wineries log onto the website and submit the detailed information themselves. All of the information can be viewed on Google Earth in 3D. 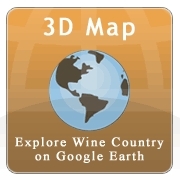 This is the first wine mapping available with vineyard location and information. Detailed poster maps of wine regions are also available from the site. 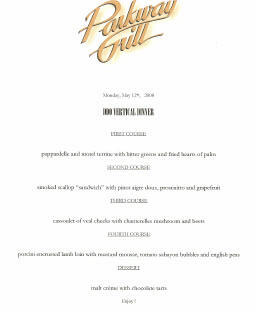 Press Club A new innovative urban tasting room has opened in downtown San Francisco on Yorba Buena Lane (SoMa). Eight wineries, each with their own tasting bar, are participating: Chateau Montelena, Fritz, Hanna, Landmark, Miner Family, Mount Eden, Pahlmeyer, and Saintsbury. A wine country food tasting menu will augment the wine tasting. Special tasting events for the public as well as private functions will be offered. For a look at photos of this stylish venue, visit the website at www.pressclubsf.com. 2008 West Coast Wine Competition The 26th West Coast Wine Competition was held April 16-18, 2008 in Santa Rosa, California. The 1,700 entries from California, Oregon, Washington, Idaho, Nevada, Baja California, British Columbia, Australia and New Zealand were evaluated by an experienced pool of judges. Jim Caudill, public relations representative of Brown-Forman Wines said, “The sheer number of Pinot Noirs now available as reflected in the competition entries, was stunning. Best of Class winners for Pinot Noir: Pinot Noir <$10.50 - 2006 Silver Ridge Winery California Pinot Noir ($9.50); Pinot Noir $18.00-$29.99 - 2006 Handley Cellars Mendocino Pinot Noir ($25.00); Pinot Noir $30.00 & over - 2006 Shandels Oppenlander Vineyard Mendocino Pinot Noir ($40). Robert Mondavi He recently passed away at the age of 94, leaving behind a wonderful legacy of bringing California wines to the forefront in the world market. James Laube noted in Wine Spectator online in a tribute to Robert Mondavi (May 16, 2008) that “At times, Mondavi’s Pinots were considered among the best in California.” Personally, I believe that statement is a stretch, as Mondavi’s Pinot Noirs were never the equal of the winery’s superb Cabernets, Merlots and Sauvignon (Fume) Blancs, and were never in the top echelon of California Pinot Noirs. 2006 Burgundy Dennis Sherman, owner of Elden Selections (www.eldenwine.com), sellers of estate-bottled Burgundy wines, lamented recently in his Spring, 2008 newsletter about the changes at Hospices de Beaune. He said: In 2005, the Hospices decided to hand the organization of the auction over to Christie’s, and for better or worse, things will never be the same. For one thing, now anyone can bid. These new-comers, often more passionate than professional, bid, not just to play, but to win. A part of Burgundy, it seems has been subsumed by a subculture that caters to people who read magazines about cigars. We’ve lost the only real benefits (aside from raising cash for charity) that such a public spectacle can accrue: first impressions of the vintage, and the mood of the market.” He goes on to talk about the 2006 vintage in Burgundy. The 2006 growing season was marked by cold in May followed by hot, dry conditions in June, July was torrid with a heat wave similar to 2003, cold and rain arrived in August, but thankfully, the sun returned in September to save the vintage. As Sherman points out, “Anyone could make good wine in 2005, but 2006 was different. Don’t expect consistent results from 2006.” He went on to say that “the whites may not be quite as good as first impressions indicated, and the reds are much better than expected. But beware! There are lots of broken wines out there, prematurely oxidized, musty from the rot.” Another take on the vintage came from Sarah Marsh, MW, writing in Decanter (February, 2008). She said that “The 2006 vintage is classic for red Burgundy. It is a vintage that reflects the variety and respects the terroir. It is a drinker’s vintage, not a vintage for collectors and investors. The hallmarks of the vintage are fragrance, purity of fruit and soft, integrated tannins. A lighter vintage, but also elegant, expressive and fresh. The Cote de Nuits seems more reliable than the Cote de Beaune.” The 2006 Burgundies, if you can afford them, will provide fine drinking in the near term while you await the emergence of the 2005 vintage wines. Recycling corks There are a couple of options now for recycling used corks. ReCORK America, sponsored by the Portuguese cork manufacturer, Amorim, has debuted a cork recycling program in California. A manufacturer of eco-friendly products in Missouri, Yemm & Hart, has partnered with Re- CORK to pay for transportation costs. Amorin is giving their wine industry customers large bags used to ship new corks to the United States from Portugal. Restaurants such as Bouchon in Yountville, wineries like Signorello in Napa, and markets including Whole Foods in Napa have joined the program. The goal is to set up cork recycling bins all over Northern California. Used corks can be processed to make coasters, clipboards, and floor and wall tiles. For more information, consult the websites www.recorkamerica.com or www.yemmhart.com. Another recycling program is Recycle Cork USA which collects corks and donates the money from the recycled materials to a program called Korks4Kids, which then uses the funds to support various children’s charities. Recycle Cork USA will provide recycling containers to interested businesses. Visit the website for the address in Pennsylvania to send used corks to: www.Korks4Kids.com. Scenic Root Winegrowers New Releases Proprietor and winemaker for Scenic Root Winegrowers and Marin Wines has another Pinot Noir to add to his stable. For several years I have touted his Pey-Marin “Trois Filles” Pinot Noir (2006 vintage, 15 barrels, $42) produced from Marin County grapes. 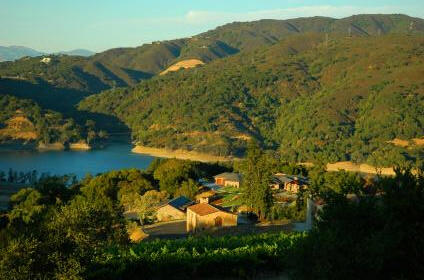 He has now released a 2006 Pey-Lucia “Frisquet” Pinot Noir from the Santa Lucia Highlands. (15 barrels, $39). I tasted this wine at the recent World of Pinot Noir and was impressed. Jonathan has obtained a long-term contract for the Santa Lucia fruit so this will be an annual release. It is a blue moon when I write about Riesling, but Pey’s “The Shell Mound” Riesling from Marin County (2007 vintage, 350 cases, $24), is one of the two best dry Rieslings made in California (the other being Esterlina’s Cole Ranch Riesling). To order, visit www.marinwines.com or call 415-455-WINE. A couple of issues ago I listed some Pinot Pet Peeves. A reader wrote adding the following to the list: (1) Bottles that weigh more than the wine inside (we’re not buying glass and carrying those cases is going to rupture something) and (2) Oversized bottle circumferences (why make bottles that won’t fit in a standard size wine cellar slot?) I concur and the wine industry is beginning to work on producing lighter weight bottles. At a recent forum in London, participants from the Wine and Spirits Trade Association and Waste & Resources Action Program agreed to step up communication amongst bottle makers and retailers to build understanding of the challenges facing suppliers in obtaining lightweight glass. It is clear that measures to reduce bottle heft would save thousands of tons of packaging waste every year, not to mention the health care savings resulting from the reduced number of hernia surgeries. I finished the single page, hit the send box, and the PinotFile was off and running. To be continued … … .